At the end of the rainy period the Buddha, seeing there were already enough Arahant disciples for the Dhamma missionary work in foreign lands, called them together and informed them of His intention, saying to the effect that they all had already been delivered from the bonds that were human and that were celestial, They should therefore wander forth to various lands, each going one's own way. This meant two of them should not go together. Their wanderings were to be intended for the benefit and happiness of as many people as possible. As such they were to preach the Dhamma in its literal and spiritual meanings, proclaiming thereby the religious life that was beautiful and perfect in all respects. Since there were some beings with a small amount of dust in their eyes. Even He Himself, so He told them, would also go to the district of Uruvel for the same purposes. The Arahant Disciples having departed each one on his own chosen way, the Buddha proceeded to the district of Uruvel people. On His way He stopped for a rest in a cotton farm. There were at the moment a group of thirty youths called Bhaddavagg ya. All except one brought their own wives for a sporting excursion there. The one without a wife had brought a prostitute instead. Now, while the youths were momentarily off guard, the prostitute stealthily made off with their valuables. Realizing the fact some time later, the youths, hurriedly hunting the thief, came across the Buddha while He was taking a rest. They asked Him if He had seen the woman they were looking for. In return the Buddha asked them philosophically if they should look for the woman or for themselves. This came as a surprise to the youths, who were somehow struck by the metaphysical, thought-provoking nature of the Buddha's pregnant question. They replied, saying they preferred to look for 'themselves', as suggested by the Buddha. Seeing they were ready for instruction, the Buddha preached to them the Five Themes of Progressive Importance or Anupubbikath as before. When at the end of the sermon they all attained Arahathood, He granted them the Ehi form of ordination and sent them forth to preach the Dhamma in distant lands. It was in the afternoon of that day when the Buddha left the cotton farm and arrived at the district of Uruvela on the shore of river Nera jar . There dwelt a large number of matted-haired hermits numbering one thousand. The leaders were three brothers named Uruvel Kassapa, Nad Kassapa and Gay Kassapa, with the retinue of five hundred, three hundred and two hundred hermits respectively. The eldest brother Uruvela Kassapa's hermitage was situated upstream, whereas those of the two younger ones respectively downstream. These hermits were highly revered by the townspeople, who regarded them as the holy ones. Upon His arrival the Buddha went straight to Uruvel Kassapa's hermitage, asking for permission to stay overnight there. The hermit was not pleased but later allowed Him to spend the night within the fire-shed where He knew there were some deadly, venomous snakes waiting. But the Buddha readily accepted the challenge and passed the time therein without any harm befalling to Him. In the small hours of the night the matted-haired hermits, who had learnt of the 'stranger recluse' who dared to stay within their forbidden shed gathered to the place, assuming He would have been killed by then. They were amazed to see Him silently engaged in walking meditation as if nothing had happened. This was the first display of the Buddha's superior psychic powers to be followed by a series of such displays no less dramatic and, to those hermits, incredible but true. Finally, convinced that he was no match for the Buddha, Uruvel Kassapa admitted defeat and floated all the fire-worshipping paraphernalia down the river and asked for ordination, which the Buddha granted them Himself i.e. through the Ehi manner. Now Uruvel 's two younger brothers, Nad and Gay Kassapa, seeing their elder brother's paraphernalia floating down the river, thought that some danger would have befallen him. They hurried to Uruvel and, having learned about the fact, did the same thing and together with all their retinue hermits asked for ordination. All were admitted similarly. After a time the Buddha proceeded to the district of Gay s sa together with all the former matted-haired hermits. There He delivered to them, possibly in conformity to their tendency and temperament, a Sermon on Fire, elaborating how many fires within their own minds there were, and how those fires can be extinguished. At the end of the sermon they all attained Arahathood. Having stayed in the district of Gay s sa for some time, the Buddha led the one thousand matted-haired hermits, now His Arahant Disciples, to the city of R jagaha capital of the state of Magadha. They took lodging within the Latthi Grove, near King Bimbis ra's palace. No sooner had He arrived than the news was spread from mouth to mouth, that there now arrived in Magadha a son of the Sakyans who, having renounced the world and attained Enlightenment, undertook to come there in order to preach to the people His sublime and Transcendental Dhamma. When the news reached King Bimbis ra, he proceeded, together with his courtiers and other people totalling twelve Nahuta (1 Nahuta = 10,000), to see the Buddha. But the Buddha, seeing a great number of people was still doubtful, not knowing whether they were Uruvel 's disciples or vice versa. Uruvel informed the people publicly of how he and the other fire-worshipping hermits had abandoned their former belief and practices. This having been done and the audiences having been made ready to listen, the Buddha delivered to them a sermon on the Five Themes of Progressive Importance. After the sermon most of the people were able to win the Eye of Dhamma, becoming Stream-winners, whereas the rest were impressed and took a solemn vow declaring themselves lay disciples, taking the Triple Gem as their Refuge for lives. The king then invited the Buddha, together with the Bhikkhus, to a meal in his palace on the following day. He took pains to attend upon all the Bhikkhus himself. After the meal he offered his Bamboo Grove, which was a secluded place with serene atmosphere suitable for those aspiring for spiritual exertion, to the Bhikkhus with the Buddha as their chief and leader. He poured the water from his urn as token of the offering of an immovable thing. The Grove had been thence forward a delightful place of seclusion for both the Buddha and His Bhikkhus. It was the first 'monastery' in Buddhism. In the Bamboo Grove the Buddha and His former fire-worshipping Bhikkhus had been staying until the first day of the waxing moon of the third month i.e. the M gha lunar month. There were during the period 250 monks of the Parib jaka (mendicants) type headed by two youths called Upatissa and Kolita. They all obtained the Eye of Dhamma (becoming Stream-winners), having been relayed the instruction by Venerable Assaji, one of the Five Ascetics earlier mentioned. All were later ordained through the Ehi-method by the Buddha Himself and, with the exception of their two leaders Upatissa and Kolita, won through to Arahatship when they were some time later given another instruction by the Buddha. 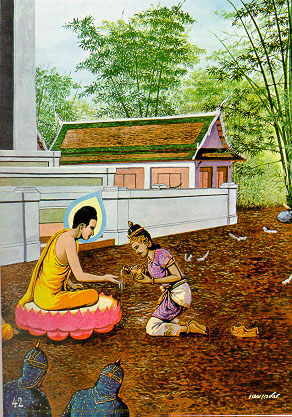 It was seven days after that when Venerable Kolita, having been further instructed by the Buddha, was able to attain Arahatship. Then on the fifteenth day of the waxing moon, the fullmoon day of M gha lunar month, Venerable Upatissa, while attending the Buddha fanning Him in the cave called Sukarakh t near the Vulture Peak, was also listening to the sermon the Buddha delivered to a mendicant named D ghanakha. Contemplating uninterruptedly the meaning of the sermons, he attained the Arahatship thereby. So it was that all the former 250 mendicants had won through to the highest grade of Noble Disciples on this day. It is worth noting that Venerable Upatissa was later nominated the Buddha's Right Hand Disciple, being foremost in Wisdom, and generally known by the name of S r putta. Venerable Kolita, later to be known as Moggall na, was nominated the Buddha's Left Hand Counterpart, being foremost in psychic powers. In the afternoon of the same day, after the Buddha had returned from the Sukarakh t cave to the Bamboo Grove, there was an assemble without prior appointment of 1,250 Arahants, 1000 of them being the former matted-haired hermits, whereas the remaining 250 being the former mendicants. They were all heading towards the Grove for the purpose of seeing the Buddha. This was something of a miracle in that the assemble consisted of four significant facts viz. firstly, the Bhikkhus therein were all Ehi-ordained, being admitted into the Order personally i.e. by the Buddha Himself; secondly, they were all Arahant disciples; thirdly, they all came there without prior appointment and incidentally at the same time; and fourthly, the occasion was on the fullnoon day of the Magh month, during which the moon was supposed to pass, in the course of its orbit, a cluster of stars called Magh . This was at that time considered by other religious traditions high auspicious for performing religious rites. Considering this fourfold coincidence, the Buddha delivered to the Bhikkhus a special sermon called Ovadapatimokkha, the epitome of His doctrine. This was the occasion occuring only once in the time of the Buddha.